DELATTE TIDE with IMO number 9421386 is the fourth vessel of TideWater in our slipways in Canary Islands. Tidewater created the “work boat” industry with its 1956 launch of the Ebb Tide, the world’s first offshore vessel tailor-made to support the offshore oil and gas industry. Tidewater’s story begins in 1955, when a group of investors led by the Laborde family of New Orleans pioneered the development of the first offshore service vessel tailor-made to support the new and growing offshore oil and gas industry. A year later, as the vessel Ebb Tide prepared to sail for working in the U.S. Gulf of Mexico, Tidewater Marine Service, Inc. commenced operations. Its first leader was John P. Laborde. HULL PREPARATIONS AND PAINTING: Cleaning, blasting & painting. TANKS: Fuel Tank Cleaning, Ballast Tank Cleaning, Fresh Water Tank Cleaning, Sewage Tank Cleaning, Lube Oil Tank Cleaning, Dry Bulk Tank Cleaning and Liquid Mud Tank Cleaning. MAIN PROPELLERS: Port Propeller and Starboard Propeller. DIESEL ENGINES: Port Main Engine, Starboard Main Engine, Generator Nº 01, Generator Nº 02, Generator Nº 03 and Harbour Generator. ALTERNATORS: Nº1 Diesel Driven Alternator, Nº2 Diesel Driven Alternator, Nº3 Diesel Driven Alternator and Harbour Generator Alternator. AUXILIARY MACHINERY: Allowance Fans, Fuel Oil Pump, and Methanol Pump. PIPEWORK: Allowance Fuel Oil Pipe and Exhaust conducts. ELECTRICAL: Allowance Main Switchboard, Emergency Switchboard and Galley Stove. We hope hold this excellent customer for a lot of years. We share our visions about the future and our commitment with the environment and safely. We give thanks to Tidewater for its confidence in our services. The growth in worldwide drilling activity is producing an increase of shipbuilding and ship repair for this year. The forecasting for the offshore industry for the next years is positive too. – the new giant discovery in the North Sea (Aldous and Avaldsnes reserve zones). – activity in the Gulf of Mexico has also begun to rebound after the Macondo accident. – the new exploration campaings in deep oil fields mainly in West Africa and Brazil. The conjunction of these factors has produced growth across all the major drivers of OSV demand. The high average age of some world fleet segments is pulling of the demand too. The shipowners are renewing their fleet and increasing their maintenance budgets. According to the United Nations in its paper “Review of maritime transport – 2011”, since 2010 to 2011, the OSV world fleet grew an 34% in DWT (from 24.673 to 33.227). For the next years the global demand for OSVs in 2012 is expected to grow. The current AHTS order book is indicating that 191 units will be delivered in 2012 and 34 units will be delivered in 2013. Experts expect the AHTS fleet will probably grow by close to 6 percent in 2012. The large AHTS fleet (16,000+bhp) is likely to grow more rapidly – closer to 10 percent in 2012 – as there are still a number of large AHTS vessels in the order book for the year ahead. The current PSV order book is indicating 146 units will be delivered in 2012 and 100 units in 2013. The PSV fleet is therefore expected to grow by 9 percent in 2012. Zamakona Yards has been played a main role in this investigation project. The objective of this Basque Maritime Forum project was the design and construction of an intelligent fishing vessel prototype to form part of the coastal fleet. The vessel will offer optimal safety standards and automation of elements related to navigation and fishing manoeuvres, and will be capable of fishing responsibly, competitively and efficiently. All the processes of the prototype will be automated. Fish handling will be reduced to a minimum. Because it will be possible to weigh and classify the product onboard, the fish-sale process can be carried out while the ship is still at sea, without the need to go to auction. Fuel consumption will also be reduced by means of dieselelectric propulsion. The final result is a pole and line tuna vessel, i.e., a vessel belonging to the coastal seining segment. The objective is to maximising vessel profitability by means of more costeffective fishing and by enabling automated control of all processes, from fish storage to net casting and from fuel consumption to equipment operation. 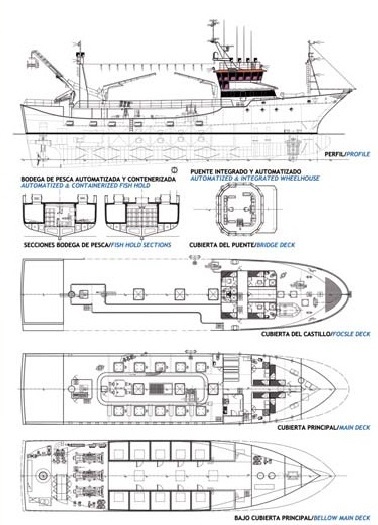 The most striking aspects of the new vessel are those featuring the greatest innovation: the modular hold, the bridge and the new propulsion system. These represent the greatest enhancements with respect to current fishing vessels. The objective in all respects was a vessel design featuring innovative elements. Priority was given to energy efficiency but enhanced safety, comfortable onboard working conditions (mechanisation and automation of fish handling, accommodation), and information and communications technologies were also emphasised. 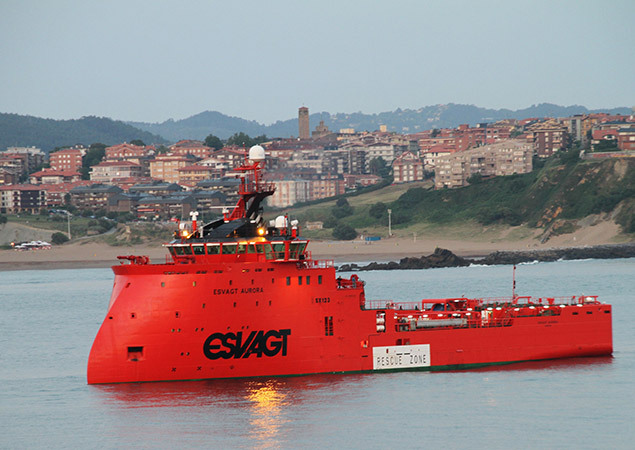 After the Esvagt Corona and the Esvagt Capella, the Esvagt Aurora is the third vessel designed and built by Zamakona Yards for Esvagt AS. The difference between Esvagt Aurora and the other vessels from her class is the fact that she has been designed and built implementing new non-standardized systems which are not available in the market. 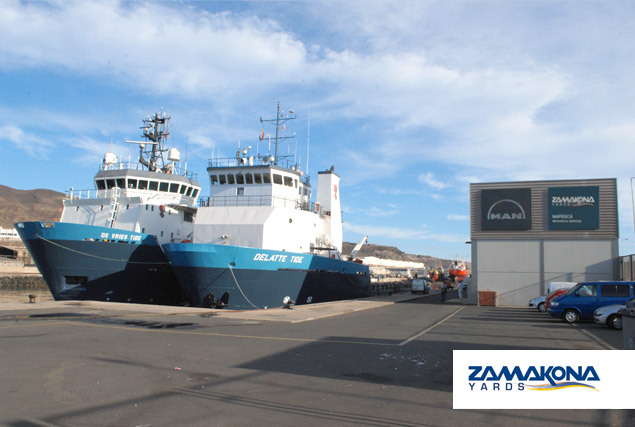 With the development of this new project, Zamakona Yards designs and builds a rescue or stand-by vessel which puts at the disposal of the Owner the technological means capable of satisfying future demands of the Norwegian oil industry (NORSOK R-002 norm) avoiding foreseeable and expensive improvements in the near future in and adapting conventional systems to the new regulations.